There are situations when you need more than 140 characters to express yourself but Twitter won’t allow you post tweets that exceed the limit. Some apps – like TwitLonger – let you bypass that 140-character limit by posting your message to another page and then tweeting the hyperlink to that page. The downside to this approach is that Twitter users will have to leave the Twitter website to read your full tweet. If you are looking for an alternative, check out the latest version of Tall Tweets. This web app also allows you to publish longer tweets on Twitter but takes a slightly different approach as shown in this video demo. 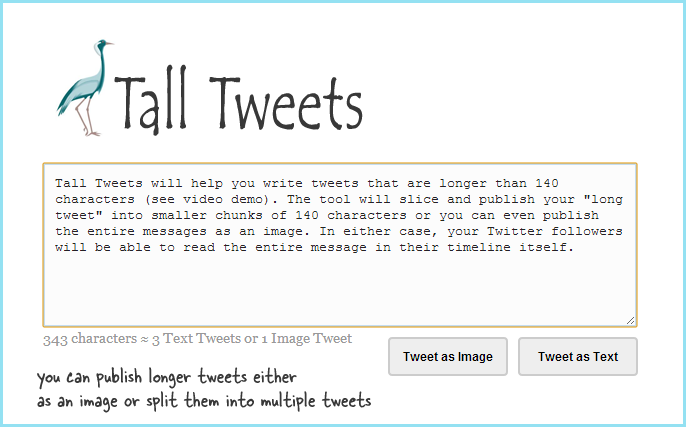 Tall Tweets will slice your tweet into multiple smaller tweets of 140 characters or less, and publishes them all to Twitter in a sequence. The tweets are numbered and are sent in a reverse arrangement such that they can be read from top-to-down inside any Twitter client. Alternatively, you may choose to publish your long tweet as an image and in that case, the entire text gets published in a single tweet. The image tweets are rendered in the Roboto font (originally design by Google for Android) and thus the text in the images should be readable even on mobile screens. The main advantage with Tall Tweets is that your Twitter followers can read your entire tweet inside their favorite Twitter client. This is also true for image tweets since most Twitter apps (and the Twitter.com website) offer inline image previews. To get started, sign-in with your Twitter account, compose a tweet and hit publish. If there are hyperlinks in your tweet, they’ll be shortened using bit.ly. The app uses OAuth and therefore you won’t have to share your account credentials anywhere.